DES MOINES – The Iowa Barnstormers have signed linebacker CJ Thompson to the 2019 roster, Head Coach Dixie Wooten announced today. 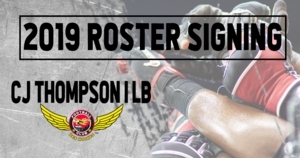 Thompson (5-11, 230, Wilmington College) joins the Iowa Barnstormers for his first season in the Indoor Football League (IFL). Collegiately, Thompson played at linebacker and strong safety for Wilmington College in Ohio for three years. During his time with the Quakers, Thompson racked up 181 total tackles, 2.5 sacks, 19 tackles for loss, one forced fumble, one interception, and one touchdown.